Here we are on 3rd January and the daylight hours are drawing out. A quick look around the garden in the January sunshine showed dozens of spring bulbs pushing up through the soil, with the promise of all manner of spring colour. Today, however, I noted the very first hint of the first spring bloom – in this garden at least, I am sure there are places where snowdrops are already in full swing! 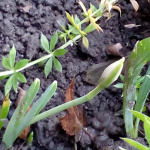 My solitary snowdrop – Galanthus nivalis – is just beginning to break bud, however and it is one that I am proud of because last year (our first spring here) there were none here at all.